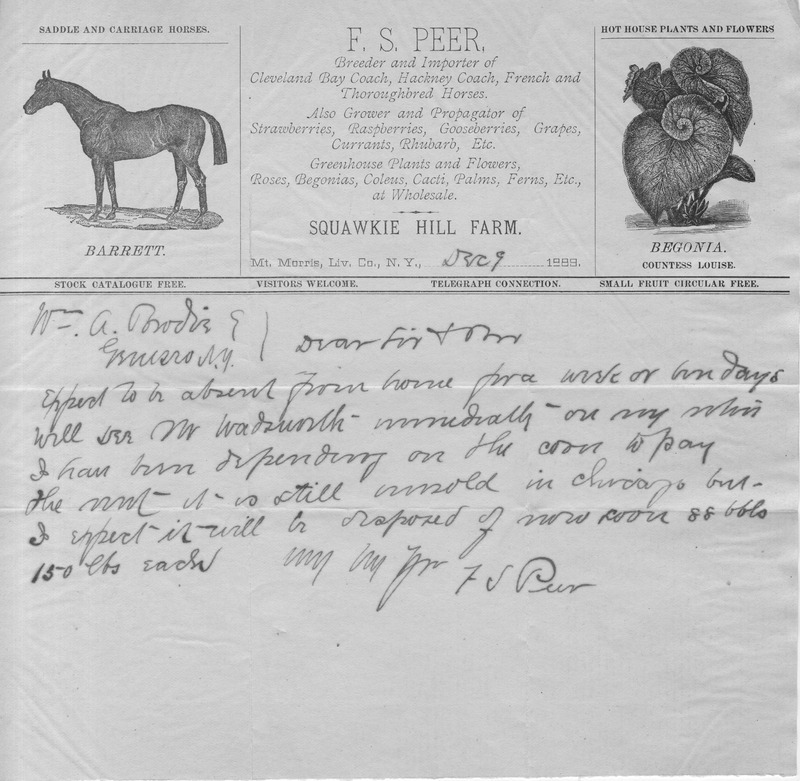 A letter from Frank Sherman Peer, owner of Squawkie Hill Farm in Mount Morris, to the Wadsworth homestead in 1889. The letterhead gives detailed information about the farm, highlighting specific aspects such as livestock breeding to agriculture. "Visitors welcome. Come and see." 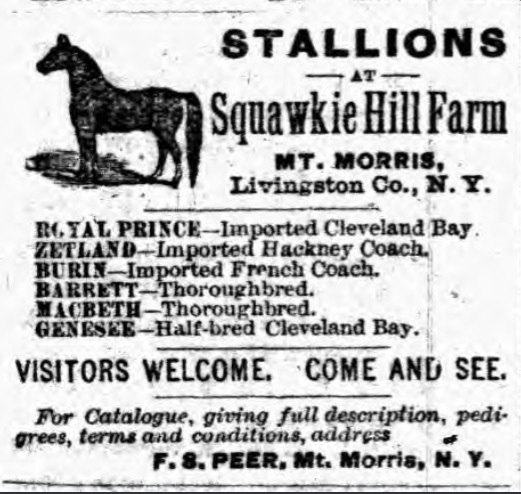 An 1887 advertisement from The Livonia Gazette concerning specific stallions bred at Squawkie Hill Farm in Mount Morris and inviting people to visit the farm. According to an 1888 copy of The Livonia Gazette, Squawkie Hill Farm was “a model farm of its class,” known throughout Western New York not only for its fine livestock and agricultural production, but also for providing an agricultural standard for local farmers to follow. Established in 1886 by Frank Sherman Peer, the 220-acre estate prided itself on breeding and importing horses, along with growing and propagating various fruits, greenhouse plants, and flowers. Although Peer dabbled in a variety of farm-life aspects at Squawkie Hill, the establishment was primarily admired for its breeding of Cleveland bay coach, English hackney coach, and French and thoroughbred horses. This is evident in the many prizes he gathered at horse shows at the Hornellsville Exposition and the Buffalo International Fair. F.S. Peer was the man who made Squawkie Hill the exemplum of the highly industrious farm. His farming career began at an early age in East Palmyra (where he managed his grandfather’s farm), and it was this experience that sparked an interest in breeding and importing livestock. After his extensive success in livestock breeding, Peer began to focus his attention on creating a soiling system for cattle. Considered a progressive farmer for his time, he concentrated on forward-thinking ways to improve agriculture--like constructing the first silo in New York. In 1882 he published a book highlighting his ideas on agricultural advancements titled Soiling, Ensilage, and Stable Construction and provided many advice articles for local farmers in newspapers such as the Country Gentleman and Rider and Driver. After his purchase of the vast farmland on Squawkie Hill, Peer continued to advocate for more innovative farming practices, first introducing the idea of raising cucumbers under glass and inventing a hot-water heater for hot-houses. Peer’s innovations not only made Squawkie Hill Farm a model for other farms but also became a vision of what a ‘perfect’ farm could look like. Why were people so drawn to Squawkie Hill Farm? Today, we often see farms such farms as more of a tourist attraction, popular especially during the fall when people purchase locally grown foods, go on hayrides, and immerse themselves in a sort of “olden days” atmosphere. During Peer’s time, Squawkie Hill certainly thrived on the kind of publicity we see with farm markets today, enticing visitors to invest in the Squawkie Hill “brand.” It was a sort of intellectual property that Peer capitalized on, not only selling horses and plants but also his knowledge of agriculture and genetic stock. Rather than just being a producer, he wanted to add value to his farm through his extensive knowledge. Furthermore, Peer was a smart advertiser and used scientific methods to attract audiences and sell his products. It was during this time that more forward-thinking ways of farming were being introduced, and it was generally understood that farming required more than just physical labor--a certain degree of education was necessary in order to manage a prosperous farm. --Biographical Review Publishing Company. Biographical Review; this Volume Contains Biographical Sketches of Leading Citizens of Livingston and Wyoming Counties, New York. Boston: Biographical Review Publishing Company, 1895. --“A Model Stock Farm.” The Livonia Gazette, 20 Jan. 1888.